The Staff Scheduling template for Excel is an affordable spreadsheet to help create professional looking shift schedules in Microsoft Excel. 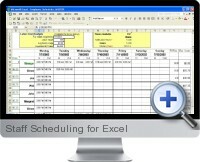 The Staff Scheduling template for Excel is designed for small businesses with no more than 25 employees who are presently creating shift schedules with paper and pen and who do not require advanced functionality of more expensive scheduling solutions. Enter the names of the people you will be scheduling in the 'Employees' worksheet. Go to the 'Week 1' worksheet. Describe your shifts column A. In Column B and C, enter the times that the shifts begin and end. Click on any gray colored cell to assign the shift to an employee. Cells that remain gray will be 'grayed out' on the printed schedule. The scheduler tracks the number of people-hours scheduled in cell B2. If the average hourly wage is entered in cell B3, the scheduler will provide a ballpark estimate payroll wages. The full version on purchase is unprotected and can be modified for customization.